Hope Wade A’ 87 has made quite a name for herself as a fashion designer over the past 20 years. She was one of the top three finalists in Project Runway:A Critique with Tim Gunn in 2015. 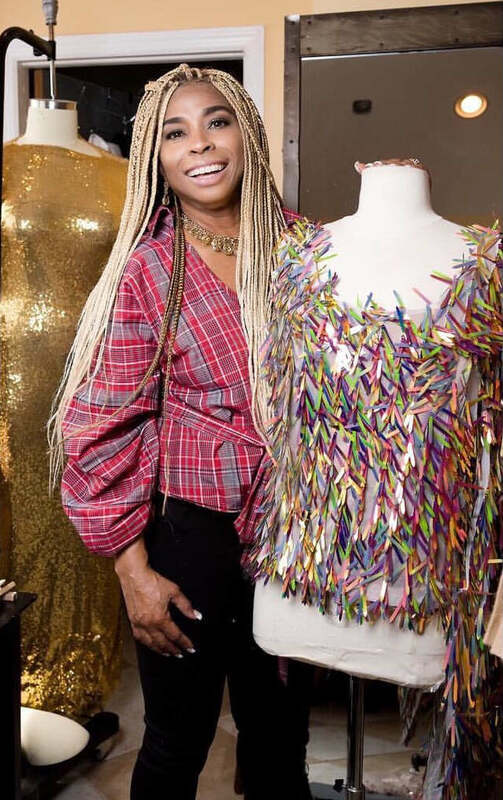 Her work was shown on Pecha Kucha with Rosie O’Donnell, and her designs have graced the runways of London Fashion Week (LFW), New York Fashion Week (NYFW) and Caribbean Fashion Week (CFW), and been worn at The Gospel Traditional in Performance at the White House with President Obama. And now Hope is a part of music history. 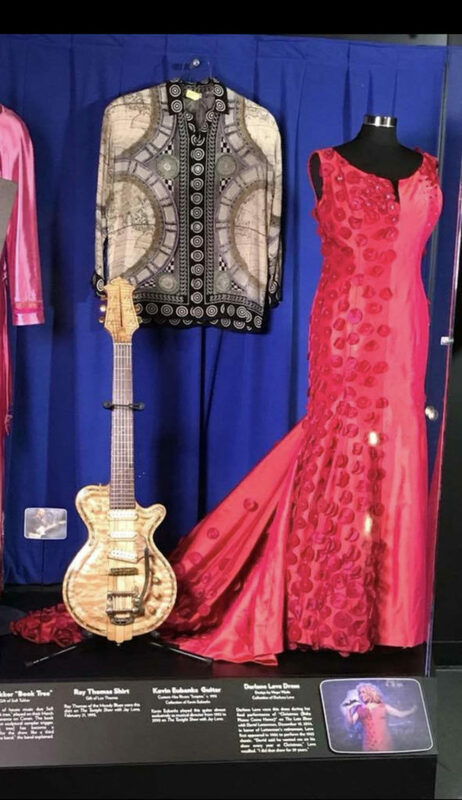 The red flute dress designed by Hope and worn by Academy Award Winner and Rock and Roll Hall of Famer Darlene Love is installed in the Rock and Roll Hall of Fame. The dress — six yards of iridescent silk with taffeta petals and rhinestones —worn by (Mrs )Love while performing on the David Letterman Show in 2014 is now on display in the Cleveland, Ohio museum as part of an exhibit called Stay Tuned: Rock On TV, which opened May 25. The multi-floor, multimedia exhibit, provides viewers with exclusive footage from Mike Meyers, Martha Quinn, Kelly Clarkson, Micky Dolenz, Kevin Eubanks, Cyndi Lauper, Paul Shaffer, and Darlene Love. Hope recalls how it all began: “I was watching The Wendy Williams Show and saw Darlene, who was promoting the movie, Twenty Feet From Stardom. The shoe cam showed her shoes, which were lovely. But when they panned up to her dress I thought, no way that dress is too bland. So I called and left a message on her phone basically saying she ought to look at my designs. It took her 3 weeks but she got back to me and agreed to see my work. Darlene saw the dress at fashion show for Gospel Music in the Park which is held in Rockland County in August. She told me she wanted the gown to (wear to) the David Letterman Show when performing her iconic song, Christmas Baby Please Come Home for the last time. And, as they say, the rest is history. Hope applied to The Cooper Union School of Art after one of her art professors at New York City Technical College (who was himself a Cooper graduate) insisted that she was Cooper material. Not fully understanding what he meant, she was nevertheless excited when he said if she got in it would be tuition free. After applying to Cooper, she heard nothing and decided to accept an offer from another college. On the last day to pay her tuition, she decided to call Cooper and find out her status. Hope was told by Dean of Students that she had been accepted and that was the last day for her to accept! Hope was a foreign student at the time, and the Dean explained that all her communications were sent to her home address in Jamaica. Hope graduated with a BFA in Graphic Design and Photography and worked as a graphic designer for a few years. Her big break came when, while in between jobs, she agreed to attend a formal event at her church. Not sure how she could buy a formal dress and pay her rent, she decided to sew her own dress. Hope used a friend, James Hayward Rolling Jr A’87, as a mannequin and the results were stunning. None of her friends could believe that the dress was homemade (until she showed them the inside, which was far from perfect). They soon became her first customers. So began her design business, Hope Wade Designs. 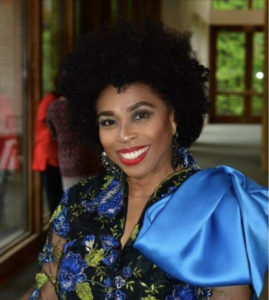 Hope is a member of the Cooper Union Alumni Association Council and sits on the Board of JAMCCAR (Jamaican Civic and Cultural Association of Rockland), Alpha Tristate Alumni Association and A Taste of Rockland. She also believes in giving back and has done many charity shows including The ARC, American Cancer Society, and Lime Kiln School. She was a Honoree for JAMCCAR 2017 for outstanding community service. Hope is married to Paul Wade and has a daughter Jasper. She resides in Pomona NY. Hope Wade has been named a Woman of Excellence by the Alpha Academy Alumni Association and will be accepting an award from the Association in Kingston Jamaica during November, 2018. Hope’s designs can be seen on the website hopewadedesigns.com, FaceBook, Instagram and Twitter: Hope Wade Designs. The company motto is ‘If You Can Describe It, I Can Design It’. This entry was tagged Fashion Design, Hope Wade, Rock 'n Roll Hall of Fame. Bookmark the permalink.